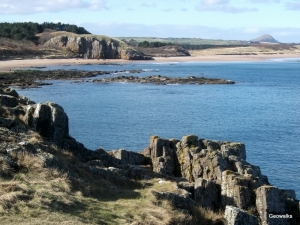 These are short, informal day walks exploring the rocks of central Scotland. The programme includes many of the best geological sites in the Lothians and Fife, places where you can get to grips with the fascinating stories that the rocks tell about our past. The pace is slow, with plenty of opportunities to enjoy the rocks, the landscape and wildlife. Please check the links below to find out more, and don’t hesitate to get in touch if you have any questions. Look forward to seeing you on a walk soon! 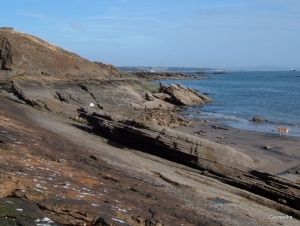 A short, varied section of the Fife Coastal Path, with a interesting mix of sedimentary and igneous rocks creating rocky headlands and pebbly beaches. Short walk, 3 hours, £10. My favourite Firth of Forth coastal walk! A traverse of the beautiful and surprisingly remote stretch of coast from St Baldred’s Cradle near Tyninghame to St Baldred’s boat at Seacliff. After visiting some of the best exposures of sandstone in East Lothian, we will walk through the remains of several volcanoes, that tell a story of moving magma and exploding vents. Day walk, 5 hours, £14. 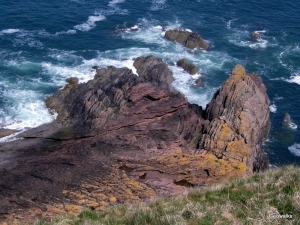 It is Scotland’s most important geological site, but Siccar Point is tucked away on the rugged coastline of the Scottish Borders, a hidden gem with beautiful coastal scenery and a rich geological story. We’ll get to the point by walking along the Berwickshire Coastal Path from Cove, gradually travelling back in time through three periods of constrasting sedimentary rocks. 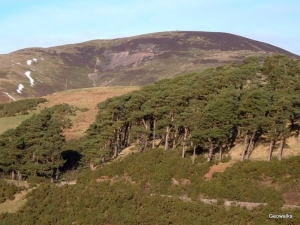 The rocks of the Pentland Hills were formed during volcanic eruptions around 400 million years ago. We meet several different varieties of lava on this traverse across the northern slopes, with good views over Edinburgh and the Firth of Forth. Guided Walks Programme Regularly updated during the year. About the Walks General details, including how to book and grading of walks. Walk Details for upcoming walks, including where to meet. See also the Courses page for more information about classroom and excursion courses in Edinburgh, and Geowalks Holidays throughout Scotland.